By choosing to stay with Naomi, Ruth was giving up her chance to remarry and have a family again. She was also giving up her homeland and everything familiar. Despite everything she had to lose she stayed with Naomi and moved to Bethlehem with her. Ruth made a sacrifice of love for Naomi. As we know from reading the rest of the book of Ruth, God rewards Ruth for her faithfulness and blesses her with a husband. Today preschoolers will learn that God wants them to love their friends. Learning Aim: God wants you to love your friends. Sing If Your Happy and You Know it. As you sing have the kids come up with silly verses to sing such as If your happy and you know it stick out your tongue or hop like a frog. Say, Many things make us happy. God wants us to focus on how to make other people happy. Today we are going to learn about how Ruth made her Mother-in-Law Naomi happy. God wants you to show love to your friends and family as well. Say, Naomi lived in the country of Moab with her husband, her sons, and her son’s wives. There was a famine in Moab and many people did not have food. Naomi’s father and sons all died. Now all that Naomi had left was her daughter-in-laws. She was very, very sad. Naomi decided to go back to her hometown of Bethlehem. She told her daughter-in-laws that they should stay with their families in Moab but they didn’t want to leave her. They all cried. Finally her daughter-in-law named Orpah went home to her family but her daughter-in-law name Ruth wouldn’t leave. Ruth hugged Naomi and would not leave her. Soon they made the journey back to Bethlehem. Everyone was surprised to see Naomi but was sad to hear that her husband and sons had died. Naomi was happy that Ruth was with her. Ask, How did Ruth show love to Naomi? Ask, How can you show love to others? Ruth didn’t have to stay with Naomi. She could have let Naomi travel back to Bethlehem alone but instead she went with her because she loved her. God wants you to love others as well. Give each child dry macaroni elbow noodles and let them arrange the noodles on construction paper to look like a smiley face. Say, Ruth made Naomi happy by staying with her. God wants us to love our friends and make them happy whenever possible. Naomi, May I Go With You? Play Mother May I. Instead of saying, ‘Mother May I go ___ steps,’ say ‘Naomi May I go ___ Steps with you?’ Have the kids line up against one wall while the teacher stands on the other side of the room. The kids will take turns asking how many steps they may take and the teacher will answer either yes or no. The game is over once everyone has made it to Naomi. Say, By going with Naomi, Ruth was leaving her family behind. If Ruth stayed with her family her life might have been easier but she went with Naomi anyway. Ruth showed love to Naomi just like God shows love to us and we show love to others. Teach the kids the following motions to help them remember the Bible verse. Do this a few times with the children. Make it fun for them to do the motions and say the words by asking them to say it loud, soft, in a scary voice, in a high pitch voice, etc. 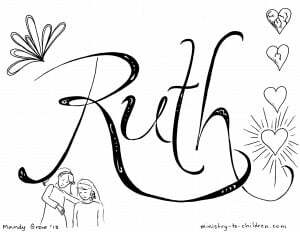 Ask each child to share one way that they can love someone like Ruth loved Naomi this week. Encourage them to show love all week long. Close in prayer. Tony Kummer (Editor) reviewed & updated this page on : June 1, 2016 at 11:37 pm. All our content is peer reviewed by our readers, simply leave a comment on any post suggest an update.